Location, location, location. That’s what everyone says when it comes to opening a new business – and the miniature golf course business is no exception. It will also be one of the most critical factors for a mini-golf course’s success. 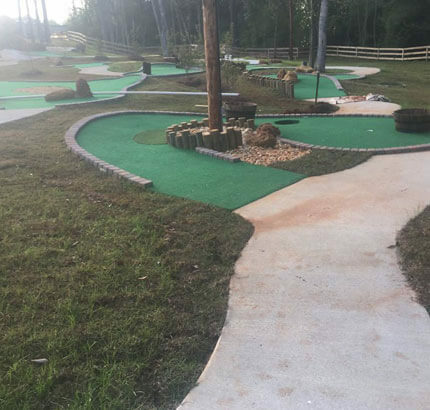 Here are some crucial considerations you should take into account when scouting for the perfect place to put your mini golf course or Family Fun Center.First, look for the perfect property and location. How big a piece of property do you need? Other companies may tell you can get away with the land as small as 6 or 7 thousand square feet and a 12′ x 12′ caddy shack but then you’ll have to cut back on a lot of extra features. You also won’t have anywhere to expand, when your mini golf course becomes a success. At Horwath Miniature Golf Courses Inc. we recommend that you look for at least one or two acres. 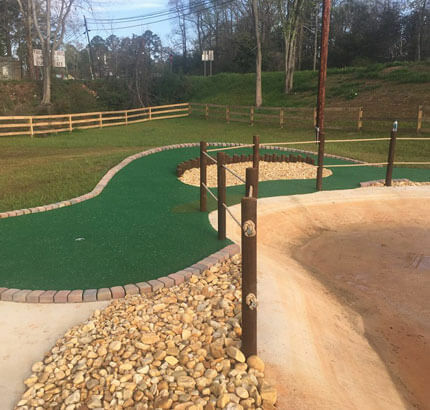 With one or two acres this allows you to create the best mini golf course possible, featuring the most dramatic and exciting physical features we can provide. It also allows you plenty of additional room for parking, picnic area, concession stands and other important extras you might want to either add on later or right at the start. We aren’t discouraging you from looking at smaller properties, but a larger piece of property offers you more options for future expansion which you should always keep in mind. Another important consideration is the physical topography of the property. If it’s flat as a pancake, you’ll have to bring in good amounts of fill to create elevations. Elevations are a must have in order to build a first-class mini golf course with eye appeal. Keep this cost factor in mind when you are figuring out your budget. Beyond the land itself, you also have to look at where that land is located. Whether you live in a big city, small town or in the country you still should look into the demographics. If you’re in an area with a smaller population, you can still make money with a miniature golf course, we can build conducive to the area. Usually, when living in a smaller town your costs for zoning, construction permits and the like will be lower. However, watch your overall budget if you foresee a limited amount of customers in your future. Also, take a look at how many visitors come to your area – and how much money they spend. Generally, a local Chamber of Commerce can furnish these statistics. Obviously, you want your mini golf course to be in a place where there’s heavy tourist traffic. Speaking of tourist traffic, remember this simple rule – no cars, no cash! You’ll get a lot of your business from simple drive-by traffic – so make sure your mini golf course is highly visible from the road and that the most attractive part can easily be seen by motorists. 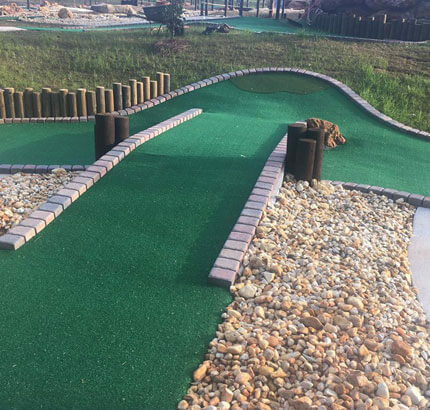 You want your mini golf course to be near cinemas, shopping malls, amusement parks and other tourist and recreational destinations if possible. Most people going to and from these places will eventually stop and play a round of miniature golf. Once they stop, you will have a new steady customer. Finally, see who your competitors are. Stop in and see how their course plays. Think about what you have to do to make yours nicer and better. Most people will play all the courses in the area, but we want to give them something to keep coming back for and that’s a Horwath Miniature Golf Course. One of the best things working with Horwath Miniature Golf Courses Inc. is working with you one on one. When you call and want to talk to a fast paced salesman, SORRY WE DON’T HAVE ONE! Instead you talk to the owner, Bob Horwath. Bob doesn’t consider himself a salesman at all; he’s just a miniature golf course builder looking to set up his next project. When you ask a company: HOW MANY COURSES HAVE YOU BUILT? They give you a number that blows you away, but what they don’t tell you is most of them were built by subcontractors they employed to build your course. When you have a problem you call them and they need to track down the subcontractor to go fix it. Bob has been building miniature golf courses since 1977 and has personally built over 180 courses. I don’t think anyone else has this experience in this industry. It comes down to if you want to spend more money than you need to, skip over Bob and call the big guys. If you’re looking for the “BIG COMPANY EXPERIENCE WITH THE SMALL BUILDER PRICE”, then we need to talk! When comparing prices, make sure you’re comparing apples to apples. At Horwath Miniature Golf Courses QUALITY, SATISFACTION AND YOUR SUCCESS is our main objection. 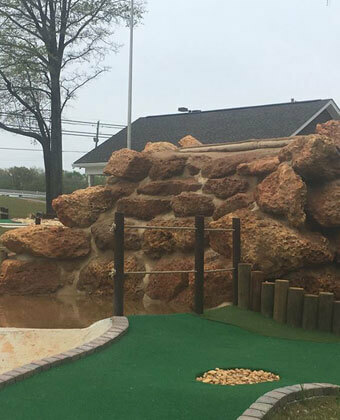 When we complete a miniature golf course, we never count it as another notch in our belt, we greatly appreciated the opportunity to create a masterpiece for people to enjoy for many years to come. We really feel working one on one is the only way to go.